The Ohio City Preservation District is comprised of 25 blocks on Cleveland's near West Side and includes Franklin Circle with six radiating streets. Ahaz Merchant laid out Ohio City in 1819, and it was initially settled by Irish and German immigrants who came to work on the construction of the Ohio Canal. The Ohio Canal was an important commercial and transportation link for the Erie Canal and many of the same Irish crews worked on both canals. Ohio City became an incorporated municipality in 1836, just two days before the incorporation of Cleveland. After years of sometimes violent rivalry, Ohio City was annexed by Cleveland in 1854. Ohio City continued to prosper until the street railway began operation and much of the commerce was siphoned off to the east side of the Cuyahoga River adjacent to Public Square and current downtown Cleveland. Many of the houses are mid-19th-century vernacular worker houses built close to the curb edge. Stylistic references include Greek Revival, Gothic Revival, Italianate, Second Empire, Eastlake and Queen Anne collectively comprising a built environment of mid-19th -century urban socio-economic diversity. 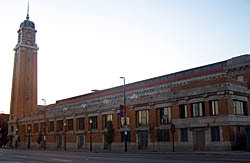 The landmark West Side Market anchors the district. The site of the 1912 yellow brick Beaux Arts market has contained a public market since 1856. 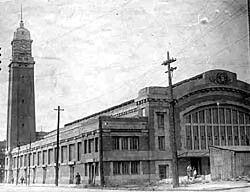 Designed by notable Cleveland architects Hubbel and Beans, the market is distinguished by its 137-foot domed clock tower. Visitors experience the bustling activity of this center for fresh produce, meat, dairy products and prepared foods. An Open Air Market is held on Saturdays during the summer and hosts many cultural activities. The market has recently been restored to its c. 1950s interior. In addition to the numerous examples of Federal, Greek Revival and Gothic Revival residences, larger and Victorian era houses are also found in the district. Notable buildings include St. Ignatius High School, the Carnegie West Branch Library and St. Patrick's Church. The high school, built in 1888 is a five-story Gothic style building with an ornate polychrome slate roof. The Carnegie West Branch Library (1910) has a robust Beaux Arts architectural style. The library is located in a central square across from St Patrick's Church. The church, made of limestone, features interior columns carved with shamrocks and ship's masts to remind them of their homeland. 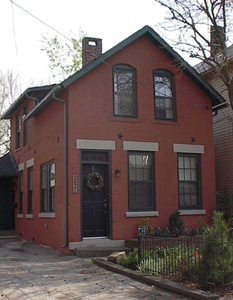 The Ohio City Preservation District is roughly bounded by W. 26th, Clinton, W. 38th and Caroll Sts., in Cleveland. Residences are privately owned, and not open to the public. Public buildings are open during normal business hours. A walking tour of the district and further information is available at their website.